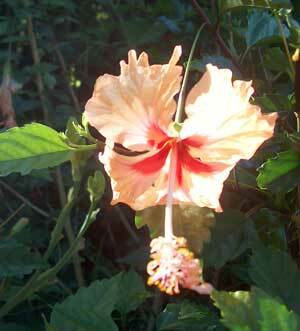 Click on the name below where there is a link shown (underlined) to see a photo of the hibiscus. Use the 'back' button in your browser to return to this page. 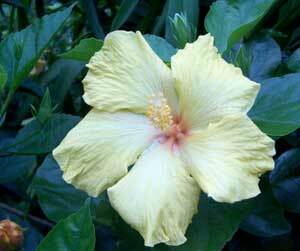 Hibiscus need loose free-draining light soil. 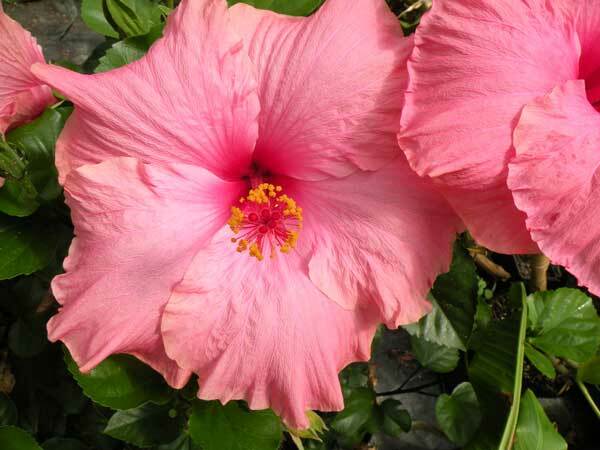 They only flower on new growth (like roses) so every August/September it is essential to prune back heavily as you would for roses to stimulate strong new growth. 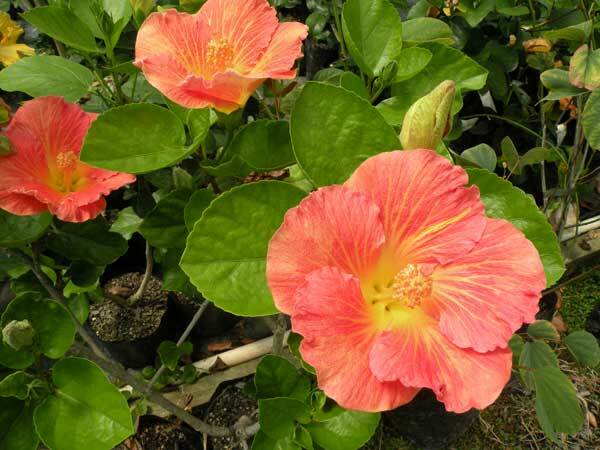 They are Lazarus plants: when they are leggy, woody, straggly old things with very few leaves or flowers, chop them down to a stump and they will bounce back with lush growth and abundant flowers from December to July. 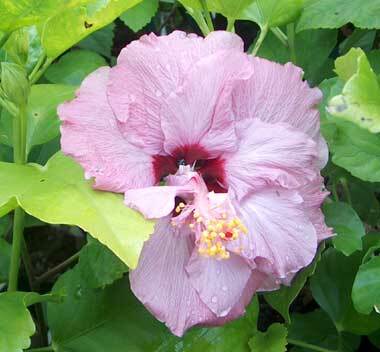 Feed Hibiscus well in the Spring/early Summer and ensure they have full sun and soft crumbly soil. They don't thrive in clay unless it is well loosened with lots of sand and/or volcanic topsoil added with compost as if you were growing lettuces or spuds! All these varieties have proven to be great survivors in my own garden as long as I have stuck to my own advice about soil conditions. 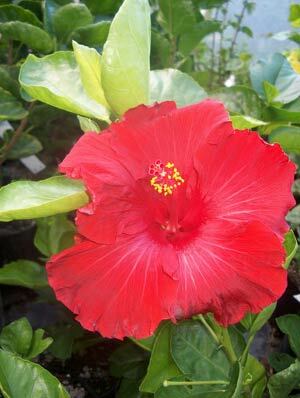 Hibiscus Hybrids are $17 each if cutting-grown. 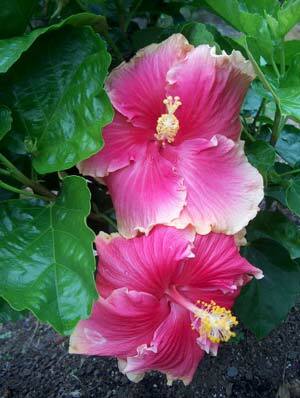 ($20.00 each if grafted). 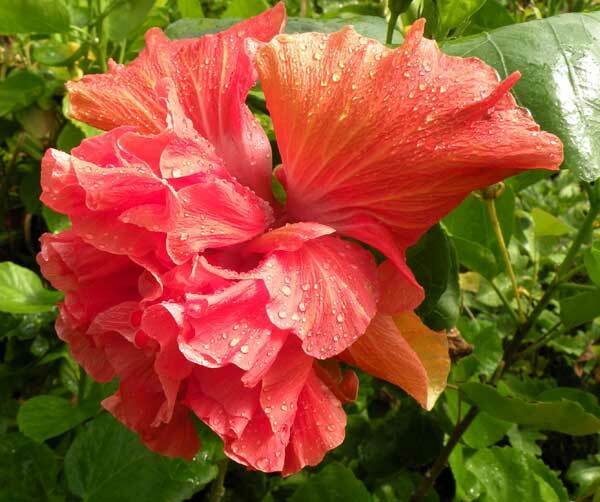 Click here for the article I wrote discussing hybrid hibiscus which appears in SCENE Magazine - a Whangarei based magazine published monthly. 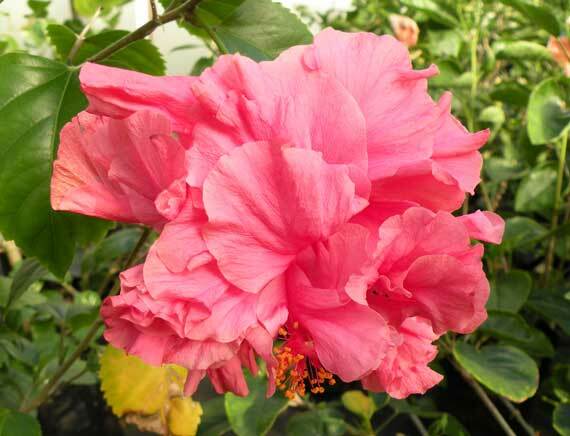 Agnes Gault Large flat satiny deep pink flowers on vigorous 2.5m bush. Very hardy & reliable. 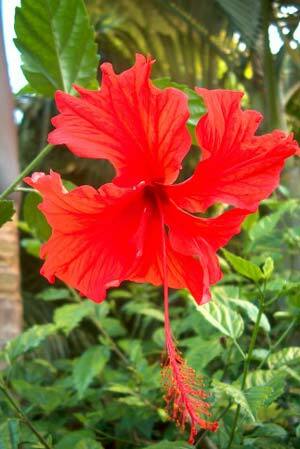 Brilliant red medium sized single flower. 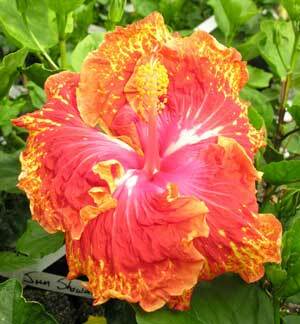 Variegated lvs. 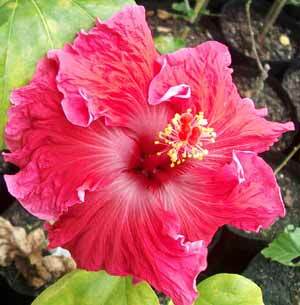 Vigorous and hardy 2m. 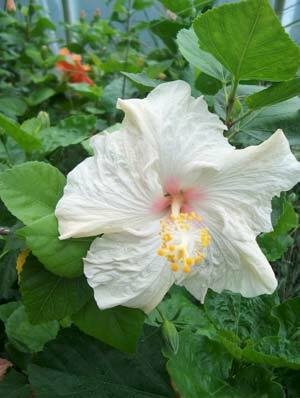 Also available as green-leaved non-variegated form. 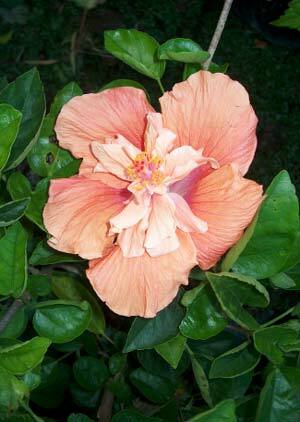 Crown of Waringah Double apricot with pink heart. Very prolific. 1.5m. 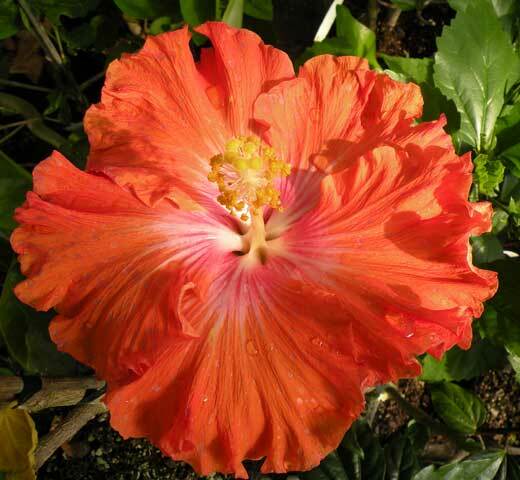 Fiesta Brilliant fiery orange with pink eye, ruffled and waxy. 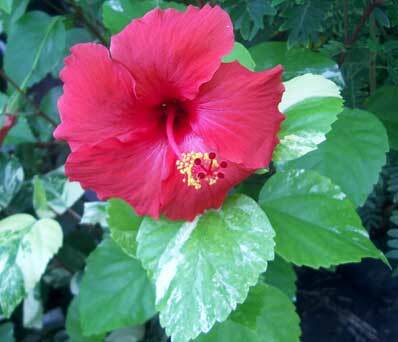 Flower lasts 3 days! 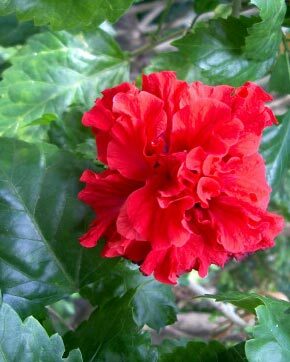 Shiny foliage, compact low bush. Outstanding. 1m. 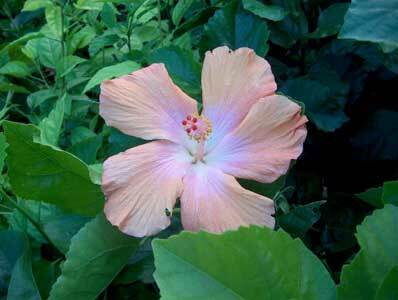 Fifth Dimension Tricoloured; opens apricot with sooty mauve inner section and red eye.. fades to yellow and pastel shades. Lasts 2 - 3 days. Unusual. 1m. 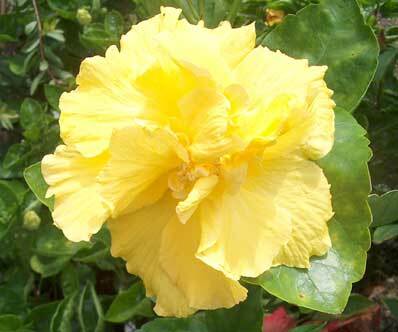 Fiji Sunshine Very hardy and reliable old Fijian single yellow with blush of gold. 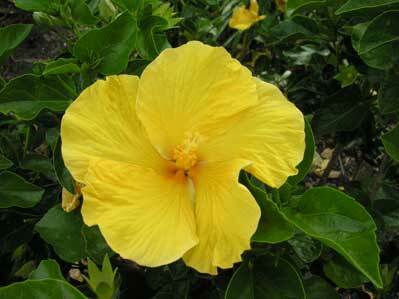 Large robust bush 2.5m. 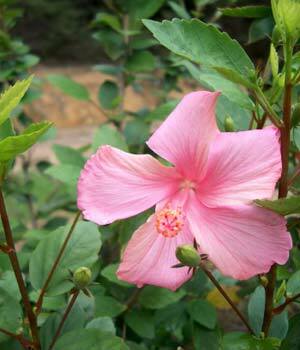 Landersii Very vigorous, reliable tall bush with masses of smallish, swirling double flowers of dark fuchsia-pink with darker centre. 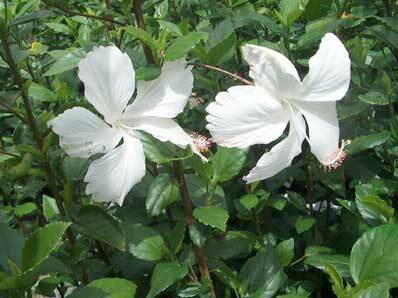 Very useful as hedging, as root-stock or specimen tree. 3m. 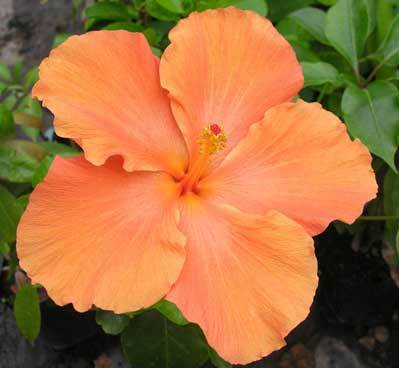 Kavitu Unusual coppery-orange double flower with mauve-pink petal bases. Striking. New from Bob Rivers-Smith 1m. Molly Cummings Blood red velvet. The best big red. 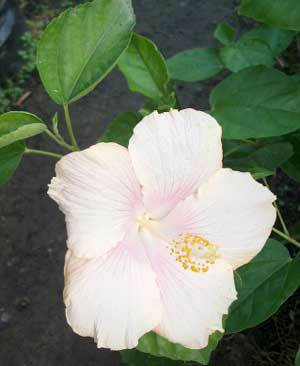 Can be temperamental.1.8m. 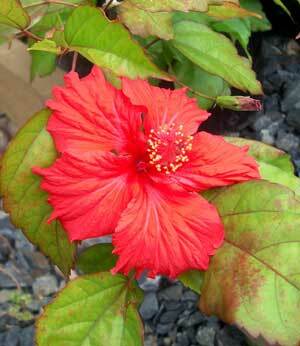 Pro Legato Blood red, semi-double, silky flowers and dark green serrated leaves. 1.5m. 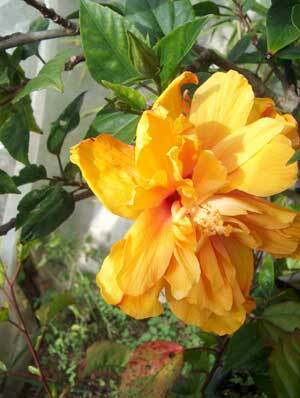 Sun Showers Brilliant deep orange splashed with vivid yellow. Sturdy upright bush. 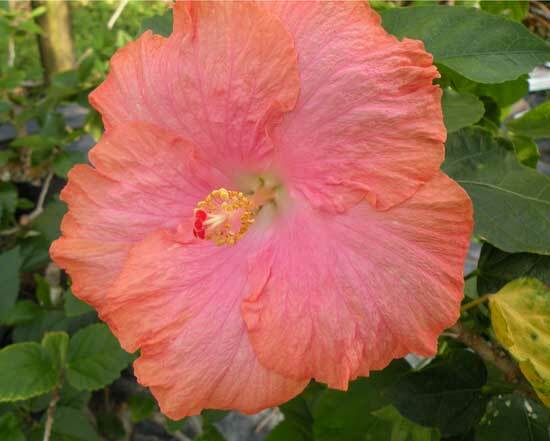 Large flowers. 1.5m. Swan Lake Pure white form of "Fantasia", mutates repeatedly to pink with both colours on the bush. 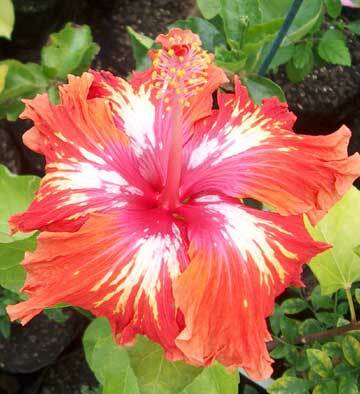 Tango Huge flat bronze blooms with red eye. Metallic sheen during cool weather. Rangy, leggy form needs discipline! 2m. August is always a good month because its the last month of Winter. 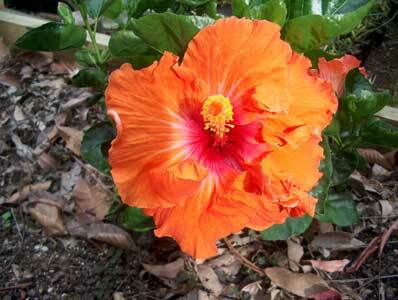 This is an important month in Northland gardens. 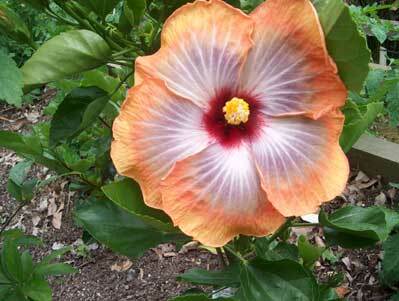 Right now its pruning time for Hibiscus and other tender plants, just before new growth starts. 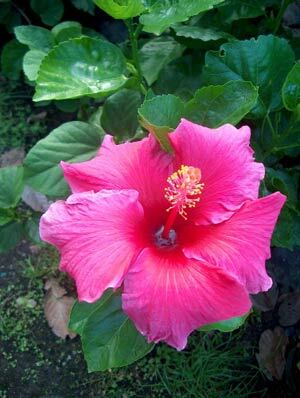 Hibiscus are like roses in that they only flower on new growth, so the more old growth you chop off each year, the more flowers you'll get. 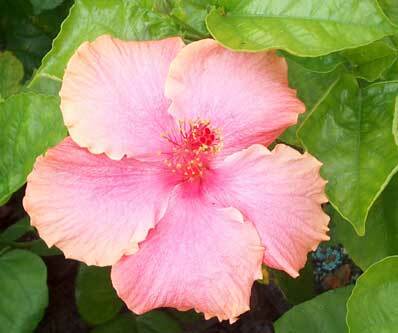 But the later you leave the pruning in the Spring, the later your first flowers will appear in the Summer. 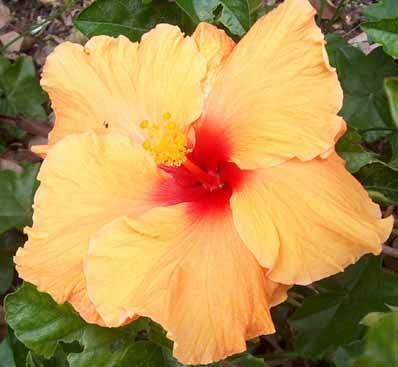 I often hear people comment that they don't like Hibiscus because they get so leggy and woody, but if you have big old leggy hibiscus bushes, just chop them down to stumps right now, and in a few months you'll have a beautiful display of dense, lush growth and masses of flowers. 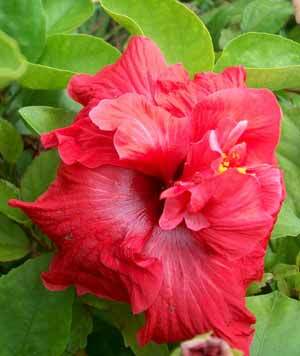 You can control the size of Hibiscus to suit yourself. 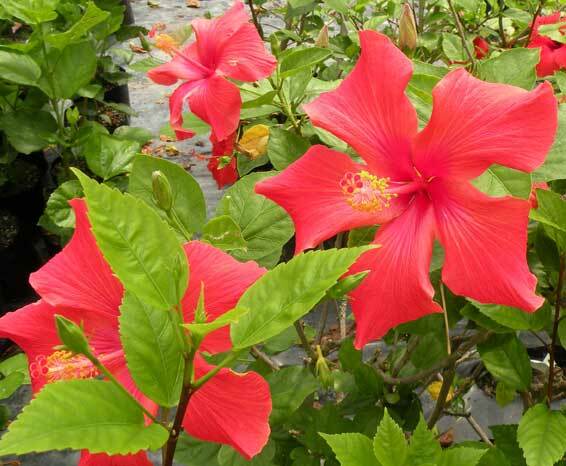 Hibiscus, like most subtropical plants are best planted in Spring and Summer when soils are warming, not Autumn and Winter when the soil is getting colder. 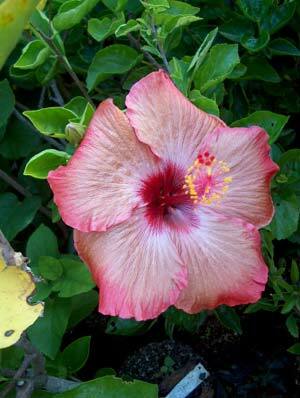 The ideal time to plant Hibiscus is from mid-October till February. 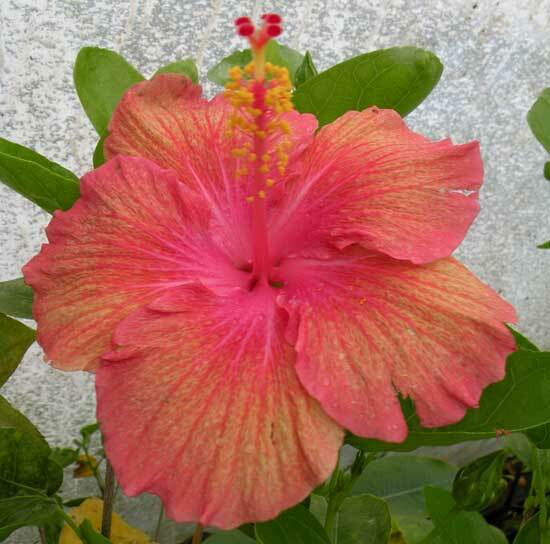 Speaking of Hibiscus, I have found them difficult to grow well in my clay soil because they, like frangipani and many other subtropicals, don't cope well with soggy cold soil in Winter. 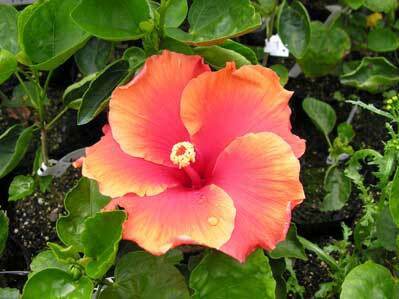 The secret is to provide them with loose, well-drained soil so there is always plenty of air round their roots. 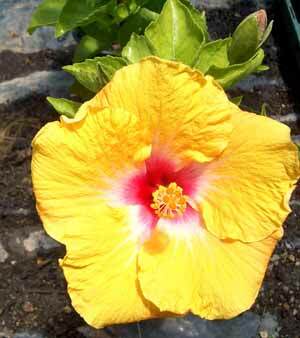 If you have clay, build a light fluffy topsoil layer up on top of the clay. 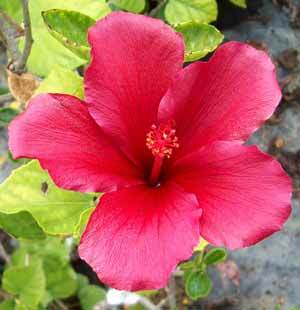 It only needs to be 150 - 200mm thick and most subtropicals will be much happier through the Winter, and even frangipani might survive. 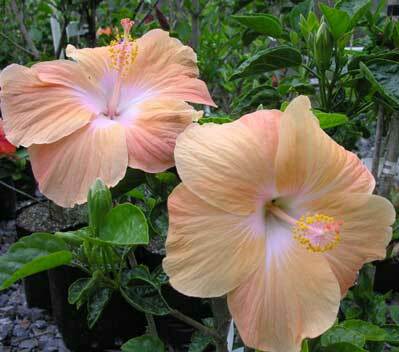 Another useful trick is to use big hefty rocks in the garden and plant your tender subtropicals close against them. The rocks store heat from the sun during the day and keep the soil warm through the cold weather. 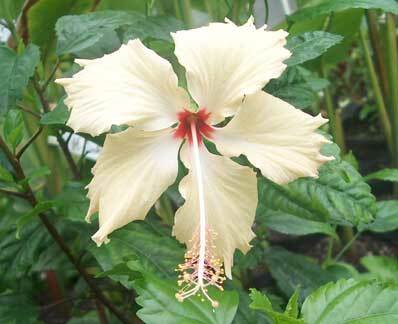 The ideal soil texture for subtropical plants is the same as you would prepare for carrots, lettuce or spuds. 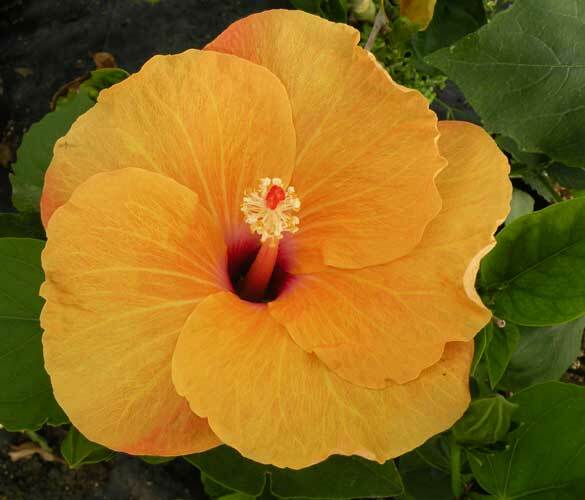 August doesn't seem like a Hibiscus time of year but apart from pruning them its also really a good time to be preparing the soil to plant them. 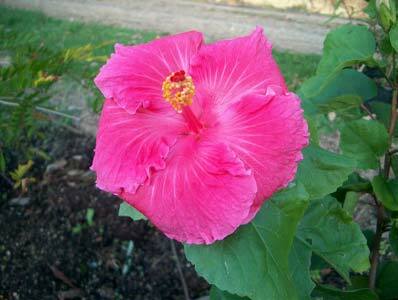 I've had a lot of fun collecting Hibiscus over the years. Many of them are such brazen, tarty things, but I can't help liking them anyway. Some would say I'm just that sort of boy. 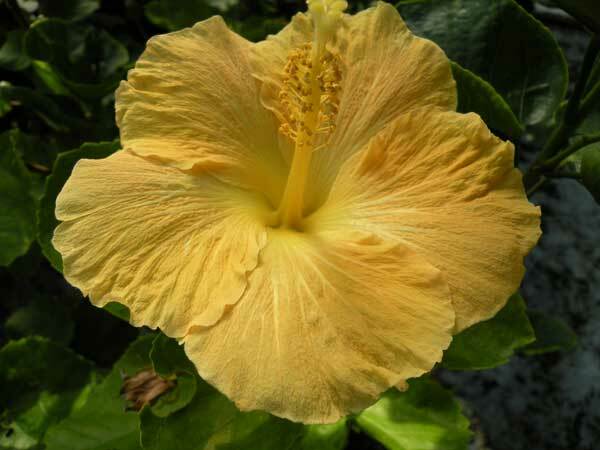 One of the most beautiful of all is the old favourite, "Golden Belle", with huge, golden flowers on quite a small slender plant, but she's a temperamental beast and only does well if the soil is light, warm and fluffy. A dark volcanic topsoil mixed with old sawdust, compost and lime is sold locally by the cubic metre as "Garden Mix". Its the perfect medium for these tender beauties. 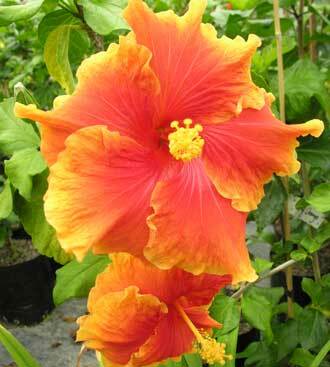 An unparalleled drama queen among Hibiscus is the wonderful "Molly Cummings". 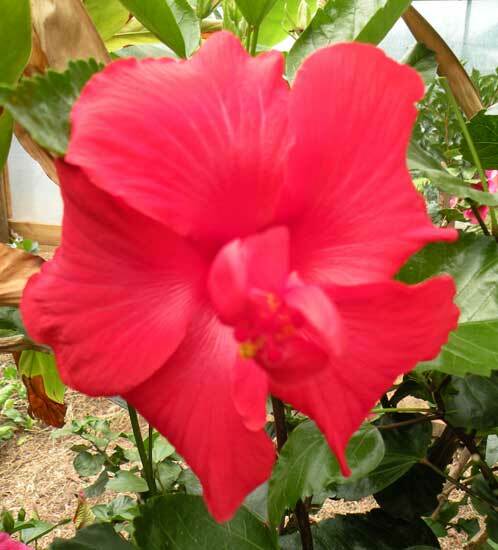 She is voluptuous, shiny and elegant, with big velvety, blood-red flowers that last for several days when the weather is cooler. She's irresistible. 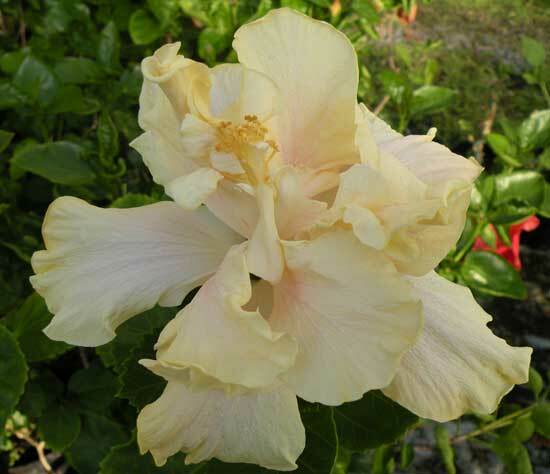 There is a charming new Hibiscus called "Swan Lake" which has dainty, pure white flowers on long dangly stems in great profusion. It has a remarkable habit of sending out branches with delicate pink satiny blooms on the same bush, and if mass planted they make a most arresting sight like clouds of pink and white butterflies from December to May. 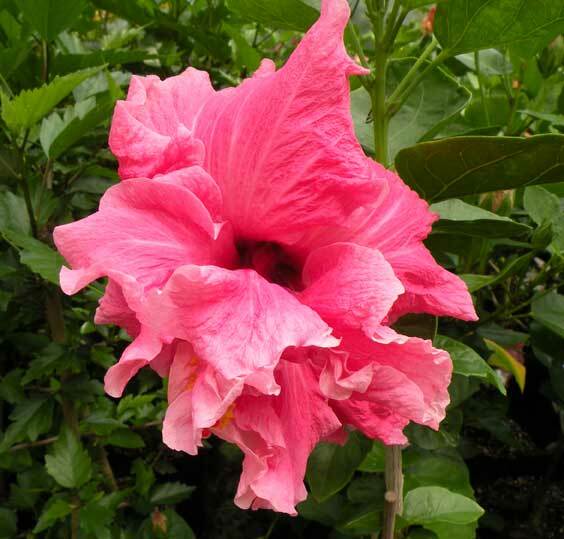 The pink mutation is sold separately as "Fantasia", and of course it sends out the occasional branch of white "Swan Lake" flowers! Most odd. I first saw "Swan Lake" growing as two-metre tall standards in tubs around a hotel pool in Bali, a lovely sight with their cascades of snowy blooms almost reaching the ground. 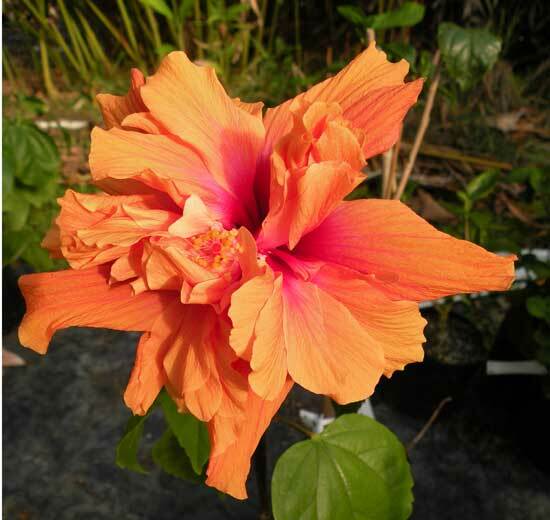 In complete contrast, the big brassy blooms of Hibiscus "Tango" are an unusual dark orange which flushes to a glittery metallic bronze as the weather cools in Autumn. These are just a few of my favourites at the moment. 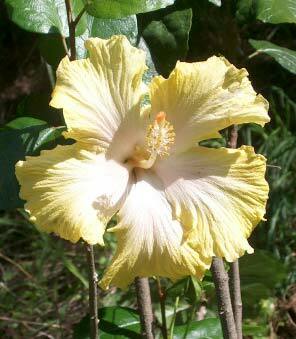 Through the Spring and Summer months I'll describe some more of the exciting new varieties I've found. Watch this space. 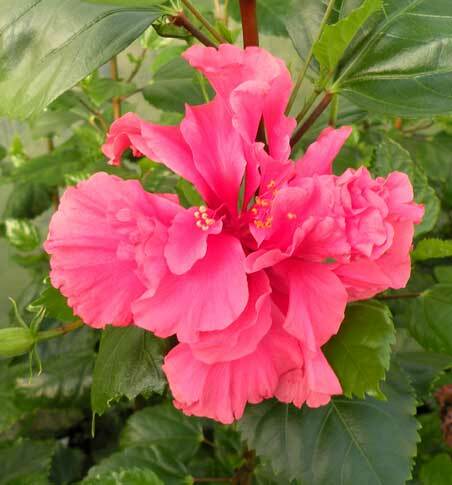 Hibiscus, as long as they're cut back regularly, are compact shiny-foliaged plants that really give a garden buckets of colour for many months and are a perfect foil to the formal, linear silhouettes of palms and the spiky architecture of Aloes, Dracaenas and Cordylines. 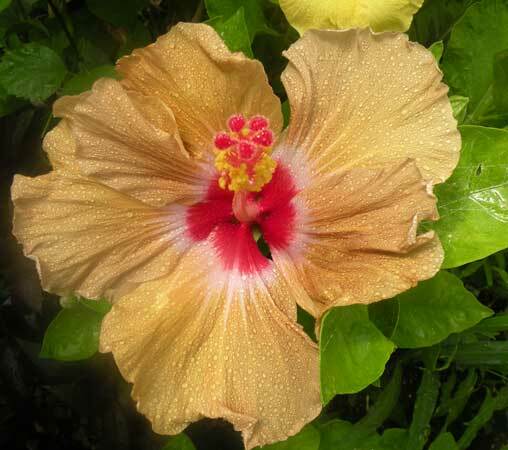 There is a classic beauty to any garden that has achieved a balance between dramatic architectural forms and the softer rounded shapes and textures of plants like (some) Hibiscus, Strobilanthes gossypinus, Hymenosporum 'Gold Nugget' and many others.